All kinds of source navigation - to definition, to usages etc. Shortcuts below. One of good starting points for basic concepts of code audits is Chapter 19 of "Web Application Hacker's Handbook" 2ed. You obviously have to have a clue what this security thing is all about, and this post is not an audit tutorial. I've created some custom inspections for IDEA, as its original "Security" set is quite arbitrary and if it targets anything, it is applets, not web apps. My inspection policies are based on the WAHH2E book and are geared towards identifying user input, dodgy file operations and so on. Open Options / Inspections. Import the policy you want to use (the full policy may produce a lot of results on very large projects, e.g. full Confluence produces about 2000 results, so I made partial policies as well), check "Share Profile", or you won't be able to use this policy. Each of my inspection configs contains a single enabled item - "General"/"Structural Search Inspection" with a number of templates. 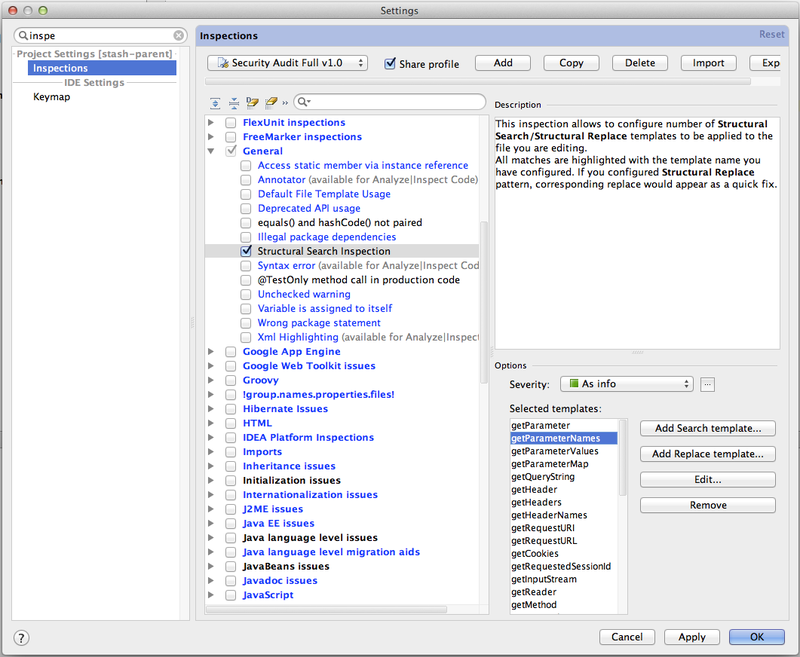 TIP: For some reason IntelliJ sometimes ignores the imported policy and as a result you will have no findings. What seems to work is to scan the code with any builtin policy, for example, "Default", and then run the security one. If you do not see the "Inspecting code..." progress window, then analysis did not happen. Templates will find points in code that are interesting for security auditor - HTTP parameters, file access, sessions, SQL queries, etc. Then you can use data flow analysis (point 1 in the list above) or simply navigate through source (below). Open "Analyze" / "Inspect code", select the policy, scope etc, run, check results. There are various ways of marking things as reviewed - see "suppress" options in the results pane. They are the same as with any other alerts produced by code inspection engine. It may be useful (depending on a kind of the finding) to investigate data flow to and from the found input/output point. There is a great plugin that will teach you shortcuts fast - Key Promoter. Any time you do something with menus, it will show you what shortcut you could use to achieve the same effect.